Dimmuborgir - the Dark Fortress at Mývatn are a true wonder of nature and nowhere else to be seen in the world, i.e on dry land. Dimmuborgir consists of huge lava rock formations which make you feel like you stepped into another world - a world of fairy-tales. The formation of these extraordinary lava cliffs and pillars stems from molten lava flowing over a pond in the eruption of Lúdentsborgir and Þrengslaborgir some 2300 years ago. I have seen this phenomenon referred to as "hraunbóla" or lava bubble. The rocks are brittle and fragile due to the process of their formation, so they are preserved and there is no climbing in them. There are several bird species in Dimmuborgir which should not be disturbed, f.ex. the falcon, so it is very important to keep to the paths and not walk on roped-in areas, which are roped in for the protection of the vegetation. Dimmuborgir is around 1-2 km in diameter and 20 metres at its highest point, with several walking paths - please, keep to the paths and follow the colour of the route you have chosen. While walking somewhere in the middle of Dimmuborgir it is easy to get lost if not following a certain path, as some of the lava formations look exactly the same and one can be almost certain to think "I've been here before". One of the routes, which is called Kirkjuhringurinn - the Church route leads to Kirkjan - the Church. It is 2.4 km and takes around 1 hour to complete. This path takes you through extraordinary tall lava formations for half an hour until you reach the so-called church. The sign says Kirkja - this is the best-known lava formation here. If you walk up the steps to the church you will notice that it is a cave open in both ends with a high-dome shaped roof. It looks like it is man-made, but it is actually a lava cave, which looks a little like a Gothic church. Returning back you walk through sand hills and close the ring by the parking lot. Just remember that the name of the entrance to Dimmuborgir is Borgarás. I love visiting Dimmuborgir - and in one location hidden away is a cave where the Icelandic Yule lads live! Here in Iceland, we have 13 Yule lads, which are quite different from Santa Claus. There are records of names of more than 70 Yule Lads, but somehow these 13 Yule lads have stayed with us until the modern times. They aren't as bad as their parents, but they are quite ill-mannered and who wouldn't be after having been raised by the two terrible trolls, Grýla and Leppalúði! Thirteen days before Christmas the first Yule lad comes to inhabited areas and then a new one arrives every day until the last one arrives on the 24th of December. We Icelanders celebrate Christmas on the evening of the 24th of December. In their strangely formed natural cave, you will find lava beds for each and every one of the Yule lads with their personal belongings. It is fun poking around in there looking at all their stuff - as long as they don't come back to find you in their cave - poking around going through their stuff!! Inside the cave is a kitchen and you can find their laundry hanging up to dry, so it seems like they just popped out and could be back any minute now. You will find a beautiful view-dial by Dimmuborgir parking lot. Where ever I travel in Iceland, I look for view-dials. The designer of this view-dial is Jakob Hálfdanarson, my father-in-law (see my photo below), and it was erected by Náttúruverndarráð (Wildlife Conservation), Skútustaðahreppur rural district and Landgræðslan (Soil Conservation Service of Iceland). My father-in-law has been making view-dials for decades here in Iceland and before him, his uncle, Jón Víðis, was in the view-dial business, but he designed the first view-dial in Iceland, located at Seltjarnarnes in the Great-Reykjavík area. The view-dial at Dimmuborgir is still so bright and shiny like it has just been erected. The harsh weather in Iceland sadly sometimes ruins the chrome on the view-dials, but not here at Dimmuborgir. But then something else happened, some people have started to ruin these beautiful and very expensive view-dials by scratching their names or initials on the shiny chrome plate! Why people do this is beyond me and I wish there was a way to stop this from happening, so we can keep our beautiful view-dials intact for years and decades to come. View-dials are so useful as they show the names of all the mountains in the area. A whole lot of very detailed work has been put into making these view-dials. I have spent days on end with my father-in-law and my husband where they were measuring the view with a theodolite. The view-dial at Dimmuborgir was erected in 1990. It is molten cylindric with a chrome plate with a time of three hours. It stands on top of an octagon wooden podium with a star - very beautiful! In my next travel-blog the Amazing Mývatn area - part III I am going to show you the Grjótagjá and Stóragjá ravines, the Mývatnsstofa Information Centre, Reykjahlíðarkirkja church, where the lava flow stopped in its tracks, and Jarðböðin - the Mývatn Nature Baths. To visit Mývatn you can rent a car in Reykjavík and drive up here in a day or two. Also, check out the self-drive tours, f.ex. 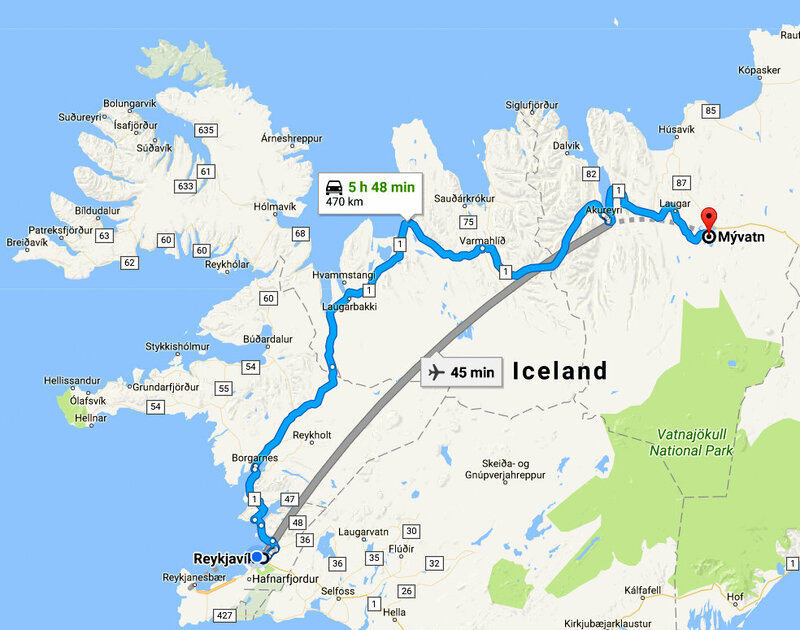 Northern Lights Holiday by Lake Myvatn | 5 Day Trip and the 7 Day Self Drive Tour | North Iceland & Mývatn.